We arrived at the Venezia Mestre train station from Firenze (Florence) on a wet afternoon. It was a 5-hour charming train ride which took us through the beautiful countryside of Italy and arrived in Venice at 1 pm. Mestre is the penultimate train stop before the last Santa Lucia station in Venice. We had booked an Airbnb in Mestre to save on accommodation costs. 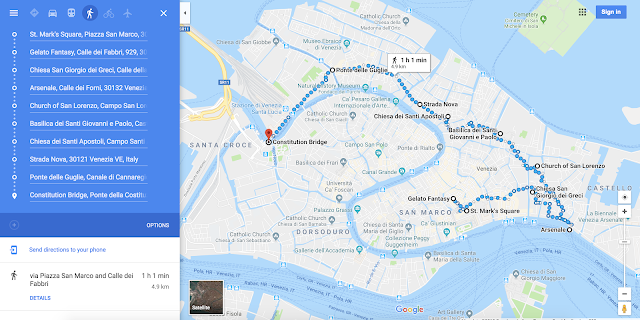 Also the fact that Venice is just a 10-min tram ride from Mestre with a couple of Indian restaurants in and around, made it a good place for us to rent. Taking the tram from Molmenti station at around 3 pm, we reached Piazzale Roma and officially entered Venice - the city on canals! 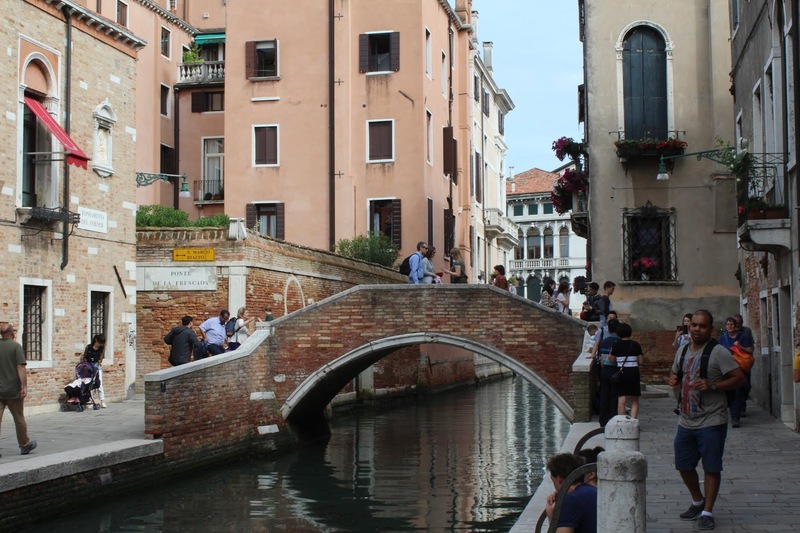 Venice is made up of 117 islands which are linked together by water canals, and numerous big and small bridges. 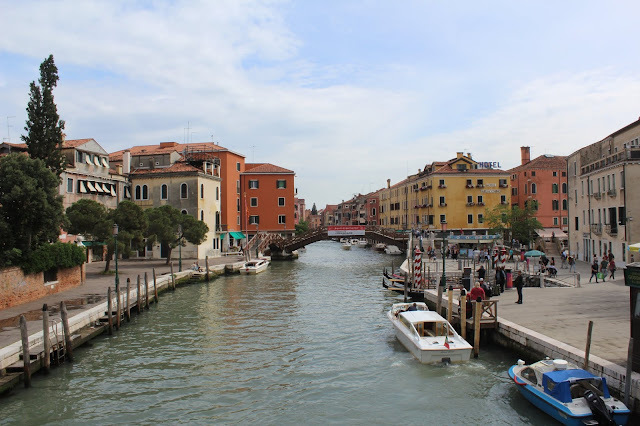 We crossed one such bridge and slowly started taking in the sights of the canals, water taxis, gondolas and vaporettis (water buses) all around us. Yes, you read it right. Water buses and water taxis! 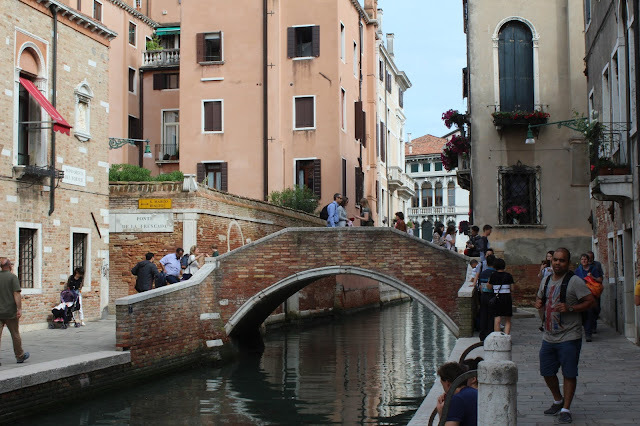 The way we have buses and taxis on land, Venice has them on its ancient waterways. Tip: The distance and time for walking depicted on maps here is just for reference. We took many more hours and walked more than double the distance mentioned here while exploring the various nooks and corners of Venice. 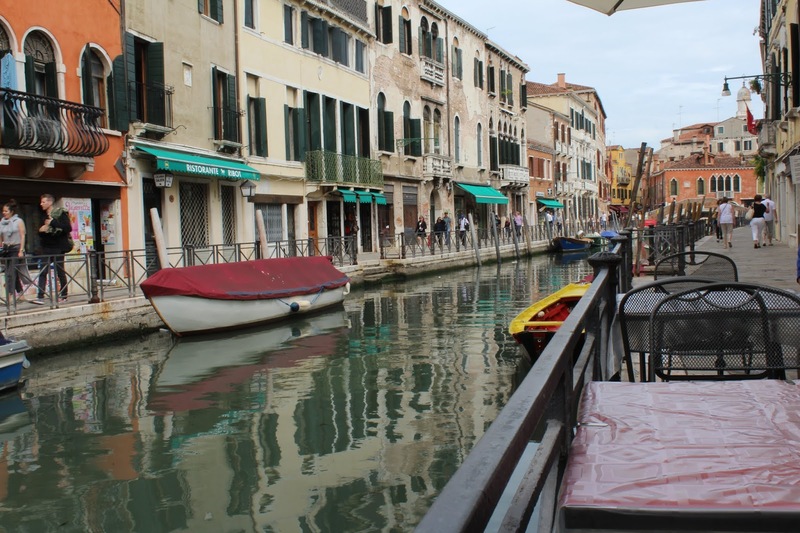 Soon enough, we leisurely sat at a pasticceria (bakery) near a canal, sipping on hot latte and munching on an cloyingly sweet chocolate cannelloni. The combination of the slightly bitter coffee with the sweet chocolate was not that bad! To add to the breezy experience, numerous gondolas rode past us carrying with them happy families with a big smile on their faces. These gondolas glided past us at just an arm's length from where we sat, brushing on their happy excitement to us. 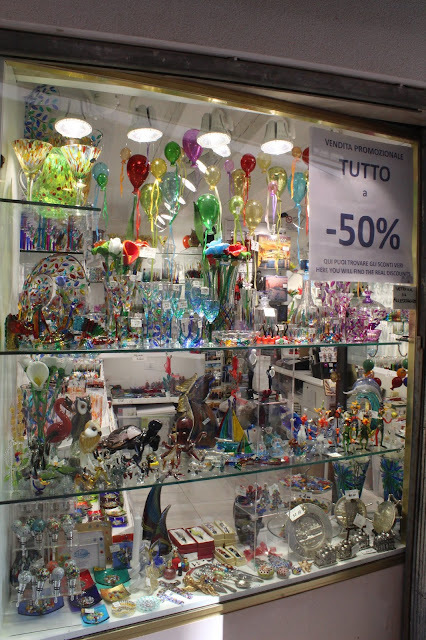 Again, we were off walking towards Rialto bridge. 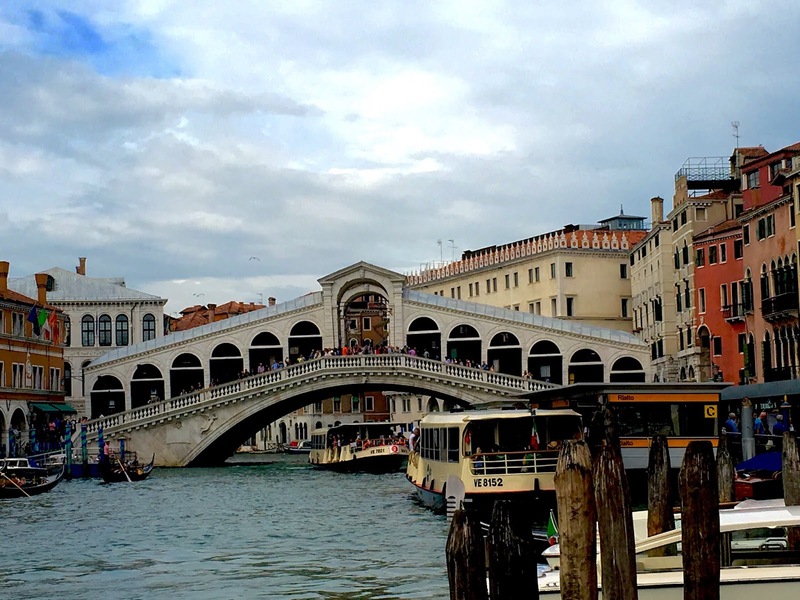 Rialto bridge is one of the oldest bridges of Venice across the Grand Canal. It is a crazily crowded bridge on any day of the year. 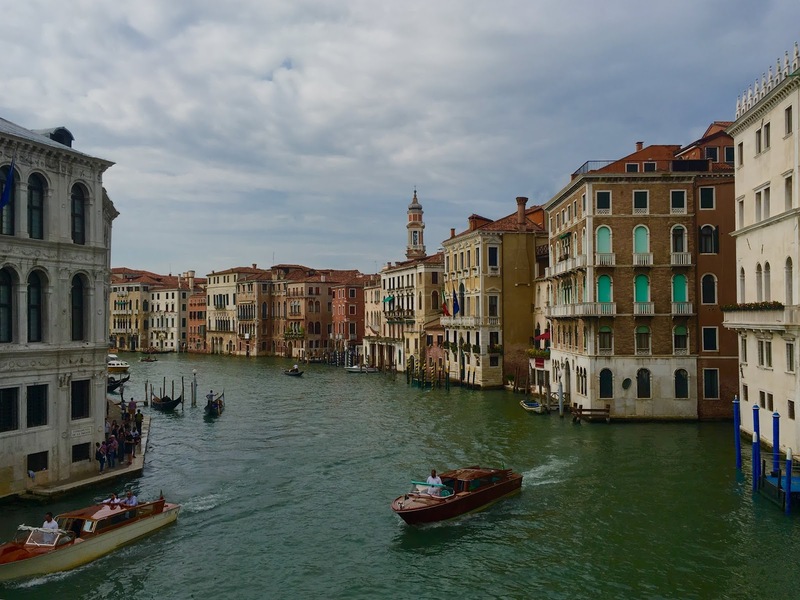 (See the pics to witness the crowds) Lined with shops in the centre, the bridge is always full of tourists clicking away merrily to capture the best vistas of the Grand Canal, this romantic city offers. The view of the Grand Canal from the Rialto Bridge with water taxis and gondolas on it. Picturesque, isn't it? 1) I would recommend Ristorante Indiano Bombay Spice and Maharani Ristorante Indiano in Mestre if you are craving for some Indian food. The former is located two stops prior to Molmenti station and is just next to the tram station. 2) Unlike India, drinking water is charged steeply at all places in Italy, including restaurants. Hence, it is advisable to buy bottled water from supermarkets which are rightly priced. However, not all restaurants allow you to bring in bottled water for consumption. We started early at around 8 am by taking the tram from Molmenti to Piazzale Roma. In 10 minutes, we were in Venice. Acquainted with the place by now, we decided to take a water taxi to Piazza San Marco. I must admit that riding a water taxi was a beautiful experience. Water buses were overcrowded; gondolas were nowhere in sight and on an impulse, we jumped into a water taxi and were happy with our decision. Cruising at high speeds on the waterways of Venice was thrilling and with the just the two of us, it was romantic too ;) It was a 15- minute fast ride to the Piazza with the winds blowing through our hair and our faces . 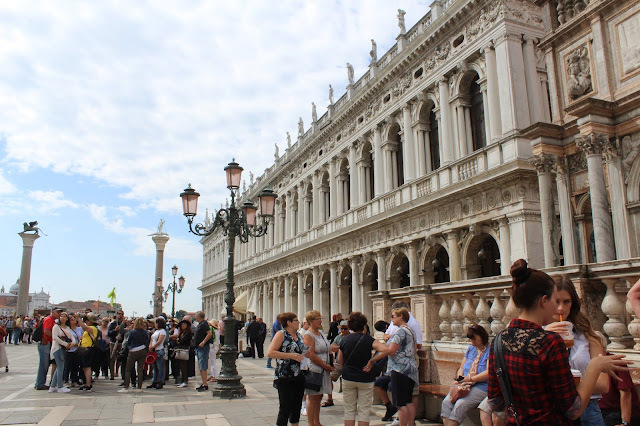 Soon, we touched the San Marco square and were standing in front of the huge palace. The piazza or the square is huge and the first magnificent building that we noticed from the waterfront was the Doge's palace. The palace was the residence of the Doge of Venice, the supreme authority of the Republic of Venice and is built in the Gothic Venetian style. St. Mark's basilica is another marvellous work of art situated in the piazza. The facade of the cathedral from outside was splendidly opulent. It reminded us of the power and wealth this unique city wielded in ancient times. Wide-eyed, we took in the beauty of the square with sheer awe, getting mingled in the increasing crowds there. 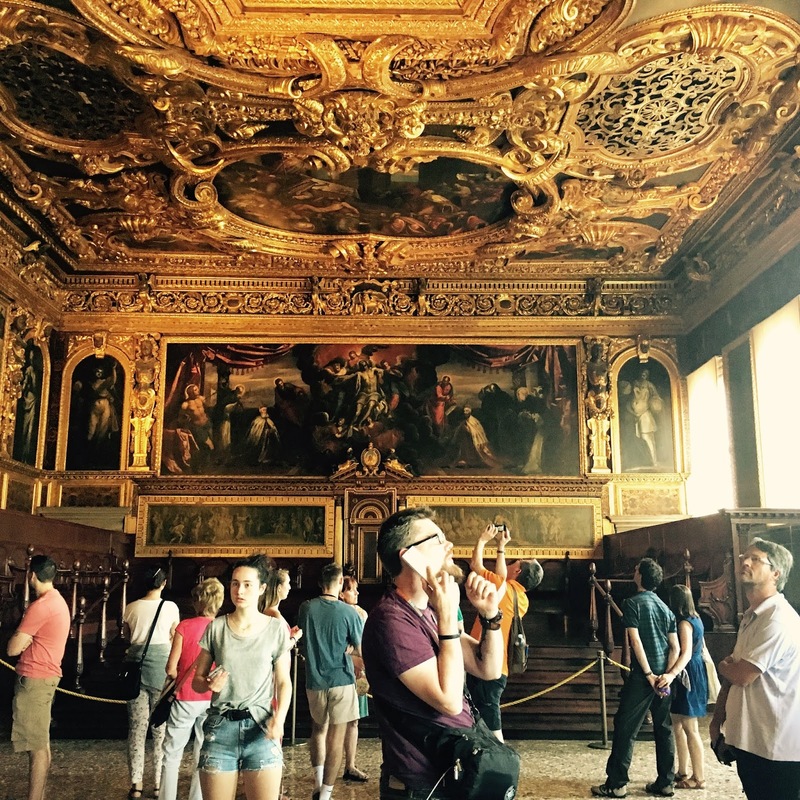 After a leisurely Italian lunch of pizza, pasta and tiramisu nearby, we wandered back to the square and decided to tour the Doge's palace. Luckily for us, the queue for the entry to the palace wasn't too big and we could get instant tickets to enter the premises. We opted for the audio guides as we did not want to be in huge tour groups and wanted our own time and space to marvel at the palace and its history. It took us more than 2 hours to tour the palace...the Courtyard, the Opera, the Doge's apartments, the Golden Stairs, its Senate room, Secret chamber, Bridge of Sighs, Prisons, Armoury and other chambers. 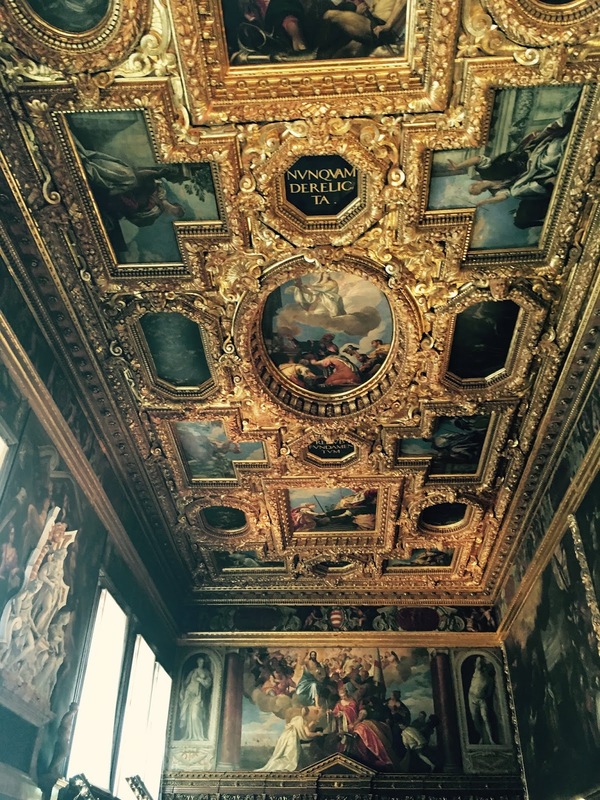 We slipped back into the olden times imagining how things would have been then in Venice. It was still early in the afternoon after touring the palace, and having lots of time on our hands we decided to walk down the cobbled paths of the city admiring a lot many cathedrals and residences along the way. 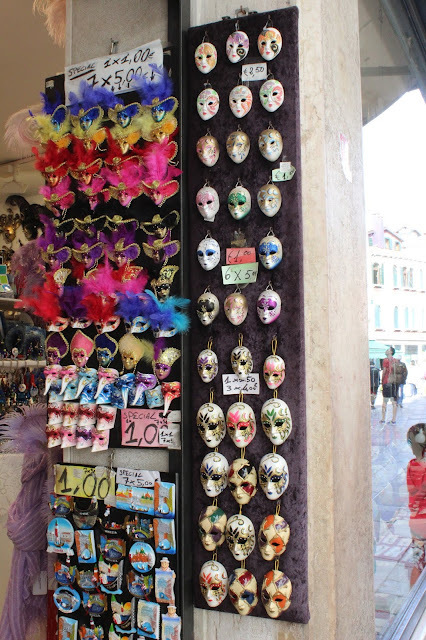 However for us, our trip to Venice had concluded that evening. 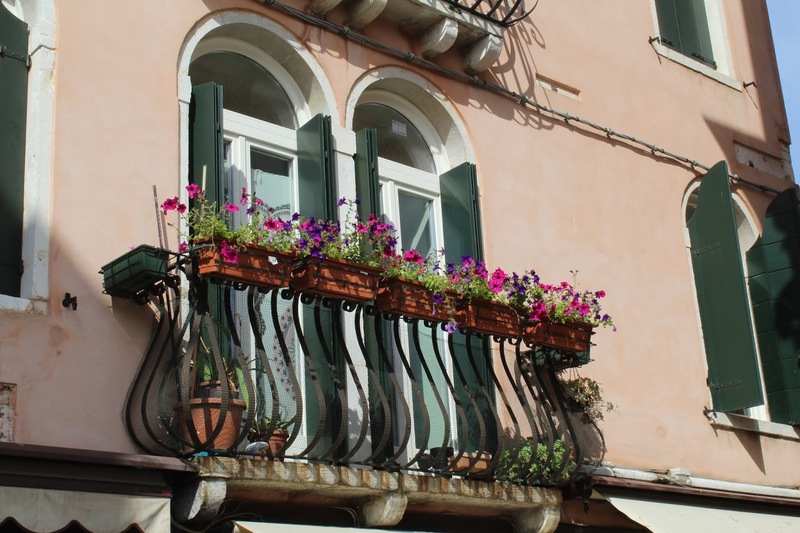 With a smile in our hearts and memories to treasure, we again took the short tram ride back to Mestre, bidding adieu to Venice.